I had in mind to process this picture remembering the Stargate series since a long time ago. After a photowalk with some friends, one of them suggested going to Temple of Debod for next session. And then, I reminded that I had this image and another similar one but with less focal length in my hard disk. So, when I came back to home, I reviewed my Lightroom catalog from Madrid , and found the 3 exposures ( 2EV,0EV,-2EV) that I shot 3 year ago. You were thinking that I let pictures without processing so much time. And it is sometimes true. I prefer to wait for a time, days or weeks in order to begin to edit the pictures for a session. After tonemapping the picture, I wanted to give it an ‘Stargate’ look. So I used the ‘Radial Blur’ In Photoshop to defocus the sky and the water in the pond and to let as a main subject the ground beneath the temple and part of it. The inusual situation in with the interior light of the temple is switched on and not the external lightning leads the eyes to this yellow gate, giving the touch ‘Stargate’. Besides, the ground and the temple are in focus and the rest of the pic is blur in order to suggest a Goaul’d ship. The photo is dedicated to the millions of fans of this series. Stargate was originally released on October 28, 1994, by Metro-Goldwyn-Mayer and Carolco as a movie. And three years later, Brad Wright and Jonathan Glassner created a television series titled Stargate SG-1 (10 seasons) as a sequel for the film. During the original SG-1 series, another one was created that was Stargate Atlantis (5 seasons) and after ending this, a last sequel series was produced, Stargate Universe (2 seasons). On April 17th, 2011, the Stargate producer Brad Wright announced that any plans for the continuation of the franchise had been cancelled indefinitely, ending 17 seasons (354 episodes) of Stargate television. Color psychology is the study of the way that things are perceived and processed by humans. The fact that colors affect our moods, emotions and behavior, has been known to humankind from ancient times. Although, the way a certain color affect someones mentality is very individual and one color can have different effects on different people. Different studies give us the evidence that human reaction to colors with different emotions. Besides, depending on our psychological state, we see colors in a different way. As a photographer, I have experimented that it is true when you are going to edit a picture. Your mood is going to influence in the color treatment that you are going to do. Although your beginning processing steps were very basic and mechanical, like White Balance adjustments and other minor basic color settings in a RAW editor. In the final steps of your processing workflow, you are going to show this, in how you do with the minor alterations to tones, doing for example a sky more dramatic, a sunset warmer… And all of this, and the results show the complex personality that you have. Your pictures are the mirror of your soul..
After editing a lot of pictures and making a lot mistakes doing HDR. I have not only discovered how to correct the hues alterations that are produced by Tonemapping Software like Photomatix. I have learnt to see the reality in my mind. To remind the scene when a picture was taken and to reproduce the colors that I saw. Besides, the emotions that I felt and that I am having in the moment of edition are mixed to reach the final image result, giving you a more hyper-realistic or surrealistic feeling to your canvas. In the case of the post picture, after making primary White Balace adjustments in LR for each exposure to generate an HDR file and tonemapping it in Photomatix, I finally mixed several layers with ‘Pop pup’ preset using Topaz Adjust plugin and ‘Tonal Contrast’ and ‘Pro Contrast’ with Nik Color Efex Pro in Photoshop over the HDR image and the 0EV exposure. The purpose was to get warmer tones and richer textures on the fountain and the grainy floor and to obtain a more purple sky. I wanted to give a dreamy touch to the picture , doing it more surrealistic , with the golden tones in the fountain and the floor, due to artificial lighting (yellow bulbs). 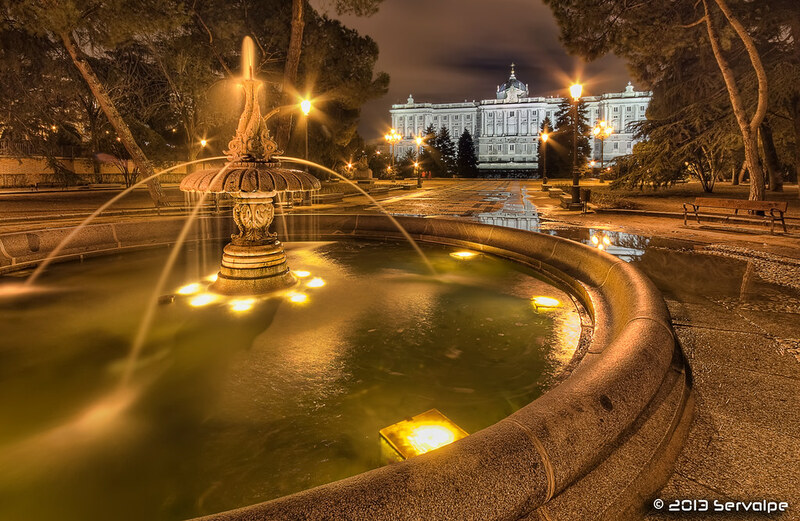 Sabatini Gardens, Royal Palace, Madrid (Spain). We always like when we see a picture with clouds motion in the sky and the blur effect due to long exposure times. This gives a surrealistic touch to the images. But the question for common people is how a photographer gets this effect. The approach depends on the time hour, if it is near night or if we are in the midday or not near to dawn or after twilight. During the day, to increase the exposure time it is necessary to decrease ISO (but this can be only done in some professional cameras and only 1 step, from ISO 100 to ISO 50). Or another solution it is to use small apertures (around f/22). But it is usual that although the diaphragm is very close, the estimated time for the exposure was not sufficiently long. So the solution is to use what photographers call Neutral Density filters (ND). – The use of ND filters produces warm or cold hues and changes your White Balance. So if you want to use the appropriate WB, you need the camera metering without filter to set it later in your RAW editor. Although, you sometimes prefer the colors created with the filter. – As the filter is so dark ( e.g ND400, ND1000) the camera has not light to calculate an exposure time. So in Bulb mode, you manually select the time. – Due to the same problem, the camera can’t focus automatically. – Set Bulb Mode ( because you time is > 30 s and other modes don’t support this). – Use low ISO to avoid noise due to long exposure. – Use a remote control to release the shot in order to avoid camera shake. – Pre-focus without filter or use manual focus. – And of course, to use a tripod or put the camera in a fixed surface. – As it is so dark, the camera again has problems to focus, but now you can’t usually focus automatically (or pre-focus) as during the day. So you can use Live View Mode to select manually the focus distance, with the help of a lantern e.g. or use what it is called hyperfocal distance ( in a short-hand, it is the distance to focus for the best sharpness, widest deep-of-field, DOF). The hyperfocal distance depends on your DSRL type sensor (Full-Frame or APS-C), lens focal length and aperture. You can get tables to calculate it. – And again, due to you have so few light, you need to set manually your time exposure. But now, the solution to calculate the time is to increase ISO and/or increase aperture (decrease f-stop number) and to take the time measure with AV mode and later adapt it for the aperture and ISO that you want or need to select with the Bulb mode. So each increment in ISO ( for example ISO 100, 200, 400) means double time. And each f-stop decrement (for example f/11, f/8, f/5.6, f/4 …) does the same. North Pond, Juan Carlos I Park, Madrid (Spain). • When I used my Canon EOS 450D (APS-C) and Sigma 10-20mm lens @ 10mm, I adapted the hyperfocal distance to a visible mark in the focus ring (usually 3 fts), so then my aperture was conditioned to f/4 or f/5.6 , I don’t remember exactly. So you can do similarly in you workflow. • To use Photopills or a similar software with calculators for your mobile. With Photopills you have hyperfocals calculator, Exposures calculator (for ND filters) and more, but this will be a topic for another post. After several years waiting for the Canon 5D Mark II’s successor, the last year it appeared the mark III. The substitute camera has enhanced Focus System, Video and fps, and more things… They have been included new features as in-camera multi-exposures and an HDR Mode too. So if you don’t know, cos you don’t follow me on Facebook, this is my new camera. I am going to preliminary review (less than 10 days with my new toy) the HDR in-camera. The EOS 5D Mark III has a new button on the left-rear of the camera, called the ‘Creative Photo’. Marked with an icon of a paintbrush, it’s a short-cut to three commands related to image control on the EOS 5D Mark III: Picture Style, Multi-exposure mode, and HDR mode. Pressing this button, scrolling to the HDR icon and pressing the SET button instantly brings-up the full HDR Mode menu. Another option is to select AEB in the shooting menu. Then, they are until 7 exposures available for shooting, more than 3 for HDR mode, but the camera doesn’t generate an HDR picture. Just let you to process the files later using third-party HDR software. HDR Mode shooting cannot be combined with BULB mode, so you need to set manually the exposures or do it automatically using SW like Magic Lantern or hardware like Promote Control. Or you can select HDR Mode in the camera’s Shooting Menu > Select Bracketing to +-1/+-2/+-3 are available(-+2 by default).And an AUTO option,when the camera reads dynamic range and on its own makes a determination of the exposure compensation needed for three bracketed shots > Choose the Image Effect that you want in the finished picture ( I select ‘Natural‘ by default) > Select Continuous HDR if you want to have several HDRs, not only one (‘1 Shot On‘ option enable). – Select your camera to save files as RAW without compression. – Set Aperture Priority Mode. – Set other parameters in the camera like ISO or aperture as you wish.I usually select AUTO ISO for handheld exposures.The camera has the ability to automatically select the slowest shutter speed used before it starts increasing ISO in AUTO ISO mode and it does this based on your focal length.I select ISO 100 when I have the camera on a tripod. The camera captures 3 consecutive shots at a fast fps rate (+2 EV , 0EV , -2 EV with default settings) and generates a JPG file with the processed HDR image. The camera software aligns the images (with Auto Image Align menu option activated), but doesn’t resolve ‘ghosting effect‘ due to objects in motion in the scene.The final HDR image has slight even if there was essentially no camera shake or movement during the bracketed shooting sequence. Finally, we can compare the results of HDR images generated by the camera and another ones processed using Lightroom, Photomatix and Photoshop. The Canon HDR images have blue hues and more cropping than the processed HDR images. The shots were taken with Auto White Balance, so I think that if you compensate it in the camera you can get a best result. I corrected WB in Lightroom previously to HDR processing in Photomatix. Besides, I processed lens corrections ( chromatic aberration and lens distortion ) in LR5 Beta. Saving the exposures with LR presets as TIFF 16-bit files. To generate an EXR file, I used HDR Pro in Photoshop, selecting 32-bit mode and to avoid disalignment, choose the 0 EV exposure to avoid ghosting and correct camera shake for the hand-held exposures. In conclusion, HDR mode in camera is useful to have an idea of how will be your HDR image and to know if you exposures cover all the dynamic range of the scene, but the cropping inside the camera, the problem with alignment and ‘ghosting’ do that it will be better to process yourself the images. If someone has wondered why I use HDR the respond is – as I commented a few days ago with a photographer buddy through Facebook – maybe, ‘cos we are crazy and we love editing pictures. In fact, he was telling that he had problems manual blending the lights and shadows of a metallic tower structure. I suggest him blending it automatically using Fusion Mode, for example, in Photomatix and later doing little changes with the exposures manually in PS. But on the other hand, from a technical point of view, the use of multiexposures techniques is due to the limitation of cameras. The human eyes can see more tones than a camera sensor. And scenes like night-shots have extreme highlights in the bulbs, for example, and dark in the sky. So it is necessary to cover all dynamic range to use DRI or HDR. – HDR/DRI Pamoramas or Vertoramas: a composition of several images horizontally or vertically overlapped between them, taken 3 or more exposures for each one. Processing them individually and merging them later with a panorama edit program. Someones prefer another workflow – as you wish – each one has its advantages and disadvantages. See Klaus Herrmann. – HDR/DRI Time lapse. It this case, we combine images at different time but focussing the same spacial elements, so we capture how some objects are moving in the scene, for example the clouds motion and how the light changes in the scene in the static elements, for example the ground. – Stars trails. A composition of trails generated at different time intervals. For example, each interval for a bit of curve generated from an exposure of around 30s with interval of 5 s with the following one. Later, all exposures can be stacked with a special program like StarStaX, in order to generate curves (stars lights trails). – Full control of DOF. To clarify the situation, the example can be marina shot with artificial lights at blue hour. The approach can be an HDR or DRI to cover the scene but the problem are the boats on the foreground. As a night-shot, to get more sharpness and less noise, it is usual to shot with a small aperture, around f11-f16, and low ISO, around 100-400. But then, the long exposure time does that the boats near the photographer are moved and as consequence we have objects with blur. Then, to get them with sharpness you can shot with a wider aperture or increase ISO. You should take a compromise between reducing DOF or increase noise in a little zone … just the boat. That depends on your camera. Changing aperture to change the focal plain. So if you combine these images, you have the same result as in macro photography when due to little distance to subject only a little zone of the photo is in focus and you can blend different shots with different focus zones to get the overall image in focus.See Daniel Cheong. – Digital Art. Another option can be multiexposures for photo montages when you want different images to do a composition or transparencies or matte-paintings (see Giuseppe Parisi). Canon EOS 450D | Sigma 10-20mm f4-5.6 DC EX HSM @ 10 mm | f11, 8s, ISO 100. HDR/DRI from 6 exposures:1 @ f5 and 2 @ f11: -2..0..+2, to get the boats without movement and the sharpness all over the picture. -The Macbook Air was my option for a robust and light laptop and I am impressed with its performances running Photoshop. -And my last acquisition, the iPhone 5 is giving me a lot of fun with its photography possibilities. I am using iOS camera to shot directly HDR, that it was not for the noise problem for iPhone small camera, it would be very useful for a professional use. But, what I love more is to spend time when I am on a bus, or traveling or a coffee break… editing with Snapseed. I am not going to give a detailed description of its features here, you can check some good reviews for example at http://www.dpreview.com/reviews/snapseed. I just go to explain how is my workflow with this app. Firstly, clarify that this tool is developed by Nik Software. Whose PS plugins ( Silver Efex Pro and Color Efex Pro) I use a lot. As the PS plugins, you have a simple version for its U-point technology on this app that permits to do some local image adjustments like color, brightness and saturation. But in any case, I use this apps to do some just quick, funny and general image adjustments to my iPhone camera images. In opposition to my usual workflow, I begin adding some sharpness and micro-contrast (structure) with the ‘Details’ tool. Later, I do some colors adjustments (contrast, brightness, saturation and ambience) with the ‘Tune Image’ tool. And finally you can add some blur with the ‘Focal Point’ or ‘Tilt-Shift’ tools. The following images compares the different editions in Photoshop and Snapseed. Processing: Lightroom for catalog > Hue/Saturation + Color Efex Pro + Noiseware + High Pass filter Sharpening technique at Photoshop CS6. Processing: Details > Structure + Sharpness > Tune Image > Contrast + Ambience + Saturation. iPhone 5 @ 4.13 mm | f2.4, 1/270s, ISO 200.Picture with iOS Camera app using Panorama capture option. An old version of this picture was one of the winners of the International HDR Day. The pictures were selected by the HDR guru, Trey Ratcliff and Rick Sammon. I was not happy with the final result of this image, so as I am usually doing in last weeks, I have re-processed it again. The picture had artifacts due to an usual problem with tonemapping software is the objects in motion. In particular, the water streams like waves on the sea or fountains. Photomatix or other HDR programs don’t correct efficiently the ‘ghost effect’ produced by the water motion, so the best way to correct this is to manually blend in Photoshop the tonemapped image with one o several exposures. Although I don’t explain this in the photo-feet because I do in a shorthand. I usually do this, also knows as Digital Blending or DRI (Dynamic Range Increase) in my current workflow ,for so many pictures, to get a more natural look on them. The manual blending is done, working with different layer masks for each of the exposures and the initial tonemapped image. I really love to do this. It is like painting. I was afraid when I was a beginner but now, I enjoy. You can try it. Just put your tonemapped image in a layer and one of the exposures in another one. Create a layer mask and select a soft black pencil with some opacity ( that depends in the image) to make transparent the above layer. They are combined to get the final image before removing noise and sharpening the picture. In this case, I used the 0EV exposure to correct the ghosting in sky cloud and fountain water and the -2EV exposure to get more details in the water flow.